Benny the Irish Polyglot and friends have made this awesome multilingual video. To see what Benny has to say about Esperanto, click here. The University of the Sunshine Coast looks likely to be the first University in Australia to prepare Primary Education graduates to teach in all 8 key learning areas. Click the image above to watch the 7 minute introductory video, or read the transcript below. Welcome! We’re glad to invite you to our innovative, brand new course in Apprenticeship Language Learning Provision. This strategy was recommended by Professor Joseph Lo Bianco (the author of Australia’s Language Policy) in the ACER review of 2009. The resources to implement it have been developed since the,n and the course to induct teachers in the use of the materials is finally ready! As you know, primary education is about preserving and developing all of the different kinds of positive potential that all children have. .... and then every university in Australia equips primary teachers to teach 7 of them! We can’t possibly know which language or languages will matter for each Australian child, but we do know that the capacity to be fluently multilingual is as much a part of normal babies as is their capacity to be artistic, athletic, mathematical, musical and more. It is the job of primary education to keep children’s options open in all learning areas, until they are old enough to choose to specialize. So our university is raising the bar by delivering a new course which will equip our students with the linguistic understandings and methodology to provide children with a fluent intercultural apprenticeship language in the first 100 hours or so of instruction. The only language simple enough to learn in a 2-week intensive course and 100 hours of teaching your class, is Esperanto because, uniquely, it was designed for quick learning and worldwide communication. Four cognitive advantages for your students, when you complete and apply this course are: enhanced ability to concentrate, accelerated learning of target languages, enhanced understanding of formal English and exercising higher order thinking skills. Neuroscience now tells us that bilingual brains are structurally better equipped to screen out distractions and concentrate. It doesn’t matter what the languages are, but it does matter that they are quite fully mastered, in childhood. 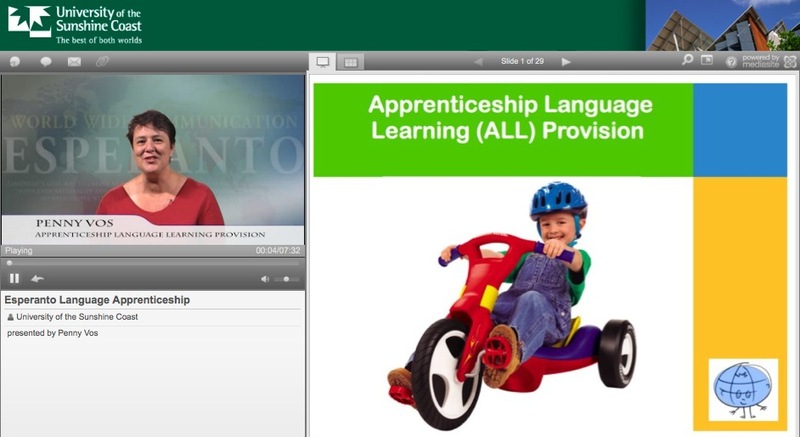 Early mastery of Esperanto accelerates the learning of subsequent languages, by giving an overview of how languages generally work, how to learn them, and increased confidence and motivation. This advantage has been shown to be stronger than the benefit of spending 100 more hours on the target language! a. Learning any language assists understanding of formal English, but Esperanto is especially supportive as it has “transparent” grammar. This means that nouns, adjectives, adverbs, pronouns and six varieties of verbs, are all easily recognizable by the last letters. As one child said recently, “I know if a word is an adjective by whether it ends with an “a” in Esperanto”. a. It might seem surprising that a solution offering simplicity should also claim to foster an unusually a high degree of high order thinking, but teaching Esperanto first does. High order thinking skills need practice to become habitual and the lack of idiosyncratic bits and pieces like “i before e except after c except if it’s weird or.... leaves more time to practice understanding, application, analysis, evaluation and creativity. b. The green diagram is taken straight from Wikipedia and reflects Bloom’s idea about how higher order thinking builds on the basics, broadening to embrace several equally vital skills at the final stage. 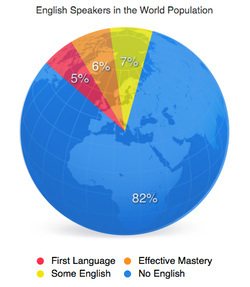 The reddish one is distorted to show how the vast amount of memorizing required in most language learning restricts the time available to practice the higher levels of thinking. By using Esperanto as the first foreign language, we can give our youngest children opportunity to practice the full gammut of thinking skills. Four social and emotional advantages for your students when you complete and apply this course are Confidence, a sense of belonging to the Global Community, Resistance to “Affluenza” and Depression, and an opportunity to identify with creative problem-solving and social justice. b. Here are just a couple of the design features which make Esperanto unusually accessible: after learning 28 constant sound/symbol pairs, many of them similar to English, you can spell anything correctly in Esperanto. b. A regular emphasis rule makes it possible to read aloud confidently from the very beginning : Emfazu la silabon antaux la fina. In all, there are 16 rules of Esperanto grammar, with no exceptions, and a system of word-building which provides a large vocabulary reliably and quickly. These children in Benin, West Africa, highlight an additional benefit of using Esperanto in early childhood. Our children are at risk of developing “affluenza”, a sense that they are hard-up and financially insecure, even though they have never been hungry, and live in homes much more luxurious than previous generations. One way to counter this unhealthy misperception is to give them contact with other cultures that are as happy as ours, with much less material wealth. The global community of Esperanto-speaking primary students includes many such cultures, as well as materially affluent ones. Esperanto is a good example of creative problem-solving, diligence and social justice, with which your students can identify to help them develop their own potential to achieve great things. I hope that you are excited to be able to provide so much that is cognitively, socially and emotionally important to your students. The children will benefit greatly from the frequent exposure and powerful role model of lifelong learning, which you can best provide. They will be unusually fortunate to be offered an immersion environment, the most successful model of language instruction we have, with assurable continuity to completion. The course is an intensive, two-week event in which you will experience the lessons and learning activities of “Talking to the Whole Wide World”, which you will then be able to teach and lead so that your students need never leave your care monolingual. The set of LOTE methodology skills that you will learn has been positively reviewed by such highly-respected experts on language education as Professors Michael Clyne and Joseph Lo Bianco. They include intercultural exploration, linguistic explanation, use of songs, stories, poems jokes, internet resources, Skype, email, competitions, videos, an extensive range of learning games, and consolidation exercises. It is a serious course, in that it seriously results in language mastery, but it is designed to engage and I bet that you’ll enjoy both the learning and the teaching. We look forward to welcoming you to the ranks of the first cohort of fully-prepared Primary Generalist Teachers, ready to teach Australia’s children in all Key Learning Areas. This is a fun, though challenging, text based on H.G.Wells' classic, available in both Esperanto and English. Depending on the age and ability of the students, it could be used for matching, sequencing or independent reading. The Esperanto version is here and the English one here. The Future of the Languages on the Internet? It is interesting to think what effect this will have on people and languages if it catches on, as seems likely. The way I see it, there will be two groups of people : Those who learn another language (maybe more than one other language) this way, and those who don't choose to get involved in language learning, on the grounds that having the whole internet available in their own language removes the need to invest time. The first group will be glad that any language is now as free (financially) to learn on-line as Esperanto is now, as long as they have free access to the internet. Esperanto will still take 100 hours to master compared to 600 hours, for most European languages, and 2200 hours, for Mandarin or Japanese. And learning Esperanto first will still reduce that 2200 hours by more than 100 hours, as it does now. The main difference, might be that both groups gain a greater awareness of the non-English-speaking world through the new availability of foreign sites in English. I think that has to be a good thing. We'll be participating in the conference at 2pm on Monday and Tuesday, 11 pm on Wednesday and Thursday, and midnight on Friday!